During the GED® Exam, you will be able to use the TI-30XS Multi-View calculator. It’s important that before you take the exam, you fully understand how to use the calculator. The more you practice with your calculator the better you will become. Knowing how to use your calculator will save you time on test day AND increase your confidence. 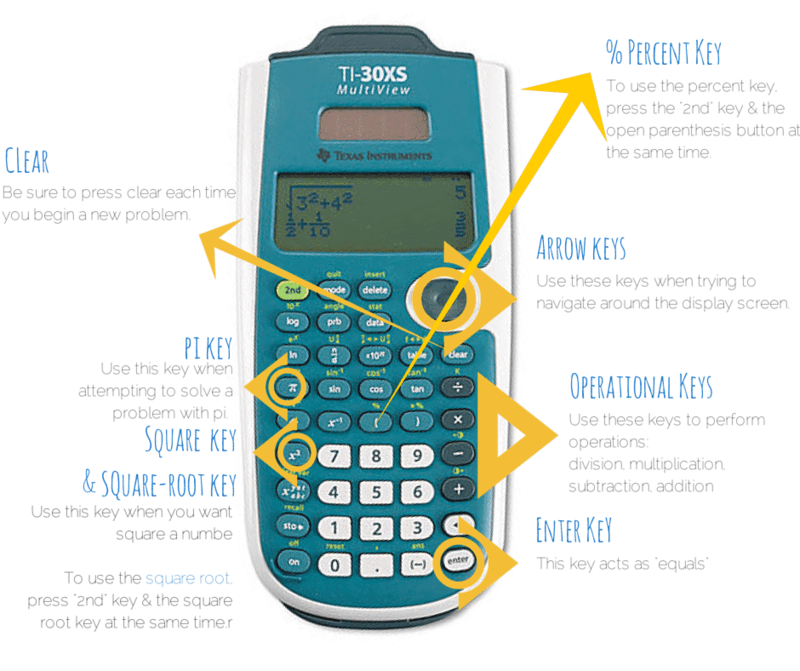 Below is a graphic showing you some of the most important buttons you should know on the calculator. To use any of the operations in green on your calculator, just push the “2nd” button while pushing the key you would like. If you do not have a calculator, there will be one provided for you ON the COMPUTER during the exam. The first portion of the exam is mental, but after that, you may use your calculator as often as you like. To read more about the set-up and time frame of the math exam. On your computer test screen, you will see a calculator icon.Click this icon to use the calculator. Once your calculator appears, you may want to click and drag it somewhere on your screen that does not cover up your test question. To move the calculator simply hold the cursor over it, pressing your mouse and dragging it to the location you want. Once it is where you wish it to be, release your mouse. Remember: There is no EQUALS button the calculator! To solve a problem, just push ENTER (shown in the diagram above). Now, use your calculator to solve these problems. Be sure that you clear your display screen before each problem.